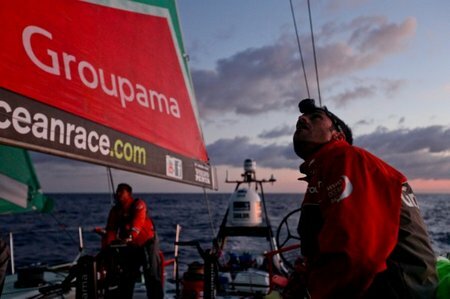 Leg one of the Volvo Ocean Race drew to a close on Tuesday when Groupama 4 and Franck Cammas/FRA crossed the finish in Cape Town at 17.28.31 UTC (19.28 local time) after 24 days, four hours, 28 minutes and 31 seconds (24:04:28:31) of racing. It is the first time that a fully French entry has been seen in the race since the late Eric Tabarly skippered the maxi La Poste in 1993-94. Groupama Sailing team score 20 points for the leg, to add to the two points awarded for fifth place in the Iberdrola In-Port Race in Alicante on October 29. The team are in third place overall. “Third is not that bad, some others are in a much worse position. But we are disappointed because especially at the end of the leg, we didn’t get to come back on the others,” Cammas said. “We are pleased to get to Cape Town and to leave with some learnings and confidence in the boat, and all the experience we have built up – it is a lot more important than any amount of training you can do over two years”, Cammas said shortly before arrival in Cape Town. The last two days have been tedious in the extreme for Groupama 4 whose progress was hampered first by no wind and then by too much. It was a tired and relieved crew that finally made it to Cape Town as dusk fell. Groupama 4 briefly took the lead on day three, November 7, but it was day four that decisions were made from which there was, almost, no going back. Cammas decided to keep inshore and follow the African coast in the painfully slow, upwind conditions. Taking a risk, which, ultimately, did not pay off, the team split from the pack, clearly confident in their choice of tactics. CAMPER (Chris Nicholson/AUS) also took the same track, but later paid a costly price to follow Telefónica (Iker Martínez/ESP), the eventual leg winner and PUMA’s Mar Mostro (Ken Read/USA) later dismasted, out to the west. The tactical gamble immediately began to cost the French team and, later that day, CAMPER with Emirates Team New Zealand bailed out to the west. The sails slatted and flogged in less than two knots of wind and Groupama sailing team became lonely warriors, heading the traditional trade route less than five nautical miles (nm) off the Moroccan coast. By day five, the French were on the ‘highway to hell’, over 300 nm east of the rest of the fleet and 42 nm offshore. “With Morocco just under our eyes, we really feel like this is the start of a round the world trip… A lonely one, and one that wasn’t really planned,” wrote the crew that day. The unbelievable scenario that the crew felt could happen, was now taking place. “Let’s say ‘we won’t see them again soon’”, wrote MCM Yann Riou. How right he was. On day six, Groupama 4 was top of the leaderboard, and Cammas was still confident. “It was not our choice to go alone,” Cammas said in a radio interview on day six. “I have nervous moments for sure, but I don’t share them. I just share my hopes. We’ve done everything we wanted to do up to now,” he said. But, by day eight, the tables had turned as the boats in the west hooked into a new weather system and Groupama were left struggling in fourth place, a position they never recovered from. That being said, their position on the leaderboard at the end of the leg looks positive enough. Team Telefónica lead with 31 points, followed by CAMPER with Emirates Team New Zealand on 29 and Groupama on 22. Abu Dhabi Ocean Racing have six points, PUMA Ocean Racing powered by BERG are on five and Sanya are on three, after all three were forced to retire from Leg 1. The next opportunity for all six to score points will be in the second in-port race in Cape Town on Saturday, November 10 at 1300 UTC. The second leg to Abu Dhabi begins the following day at the same time.